Adding an SSD to your laptop is the most effective upgrade you can perform. Which SSD should you buy? Our first test is Crystal Disk Mark 5.2, a pure storage benchmark that shows just how much more performance you get from even a moderate SSD. 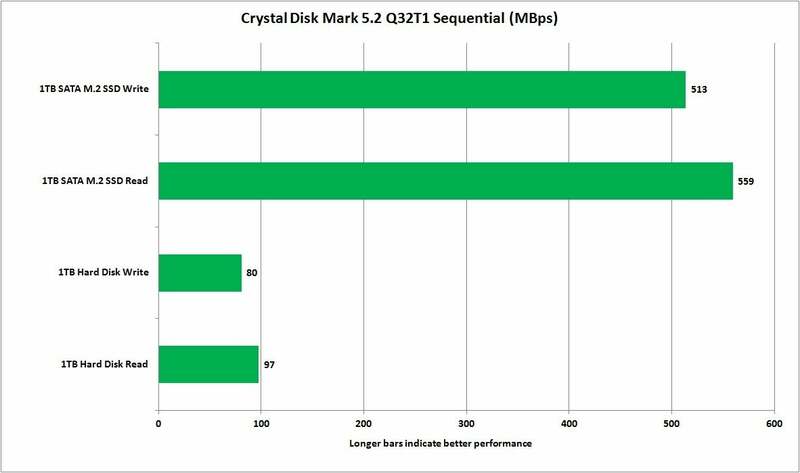 Crystal Disk Mark shows just how slow a hard drive is even against a SATA SSD. It’s not just in that test either. Unlike a memory upgrade, which doesn’t give you performance boosts across the board, an SSD is pretty much fast everywhere. Below are the results from PCMark 8’s storage bandwidth test, which puts the SSD about 30 times faster than the hard drive. 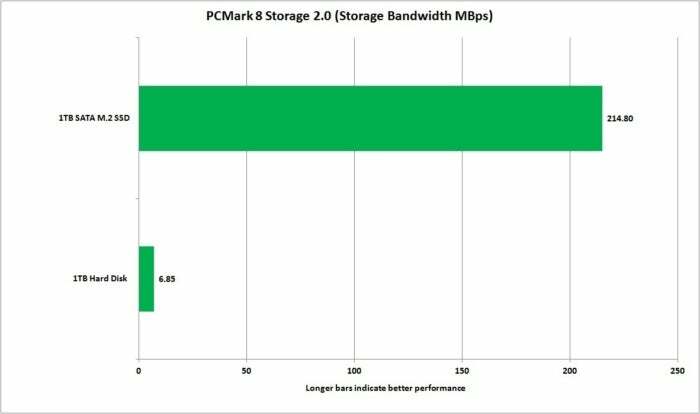 PCMark 8’s storage bandwidth test puts the SSD just over 3,000 percent faster than the hard drive. PCMark 8 also measures such things as how long it would take to launch and log in to World of Warcraft. You can see the practical upshot is, well, wow. 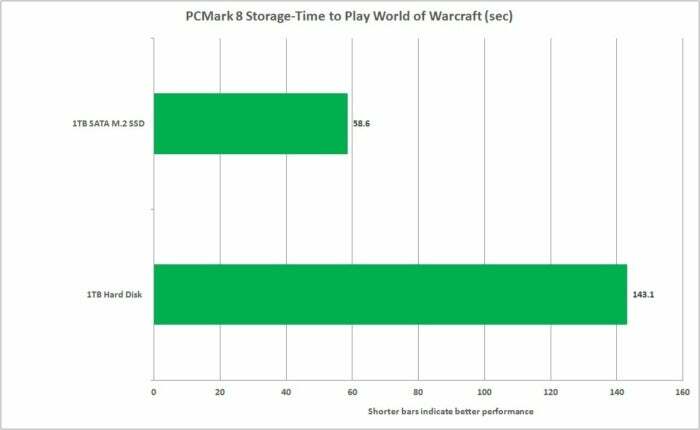 One thing PCMark 8 measures is how long it takes to launch and log in to World of Warcraft. If you’re now convinced that an SSD is the answer but you want something a little cheaper or you don’t want to deal with an M.2 drive, the best option is to outright replace the hard drive with a standard 2.5-inch SSD. If you go shopping for an SSD your head is likely going to explode from the options available. Since we already know we’re going with a SATA drive, the job is a little easier. If you’re wondering about the advantage between an M.2 SATA SSD and a hard-drive-sized 2.5-inch SATA SSD, there isn’t much for regular folks. very decent performance to plain dog performance. So we recommend that you start with our SSD buyer’s guide. It’ll let you know what our best pick is currently. Even if you don’t go by our list and you end up with an SSD that’s only mediocre in performance, it’ll still feel miles better than a hard drive. That’s because the actions on a hard drive that make it feel slow—called random reads—will still be infinitely better on a medicore SSD. In other words, you’re probably okay buying on price and capacity. You determine that based on your needs. If it’s your sole computer, we recommend planning for additional space—for many people a 500GB drive will the job. If you’re the kind of person who doesn’t horde photos and videos, a 250GB drive will likely last a long time. Okay, let's do this. On the Aspire E 15 it’s a snap. 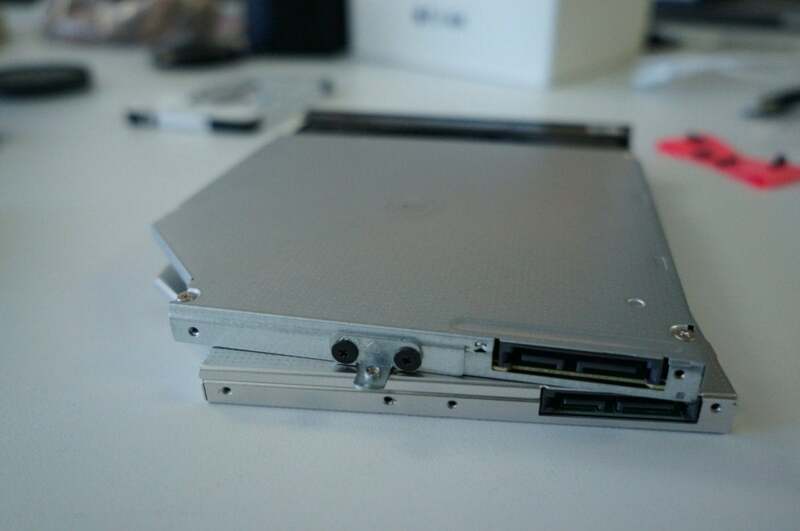 To remove the hard drive from the Aspire E 15, grab the plastic tab holding the drive and slide it away from the connector (right side) about half an inch. 2. 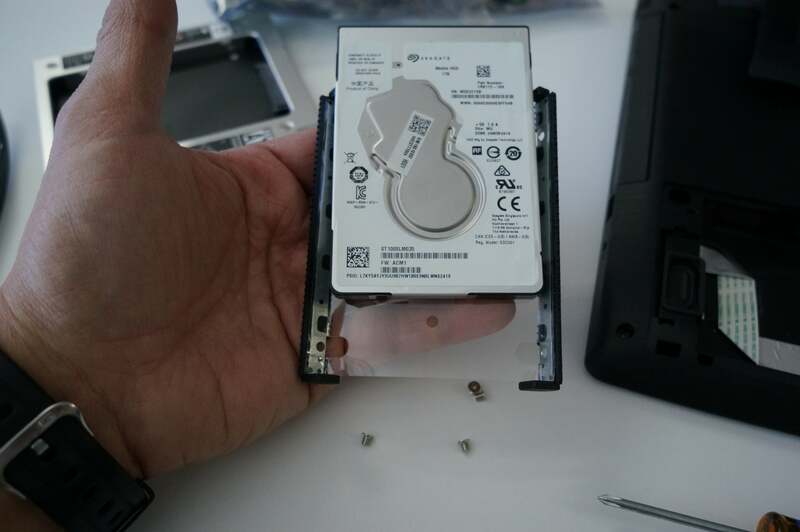 With the hard drive out of the computer, remove the four screws on the sides of the drive and take the drive out of the plastic tray. 3. 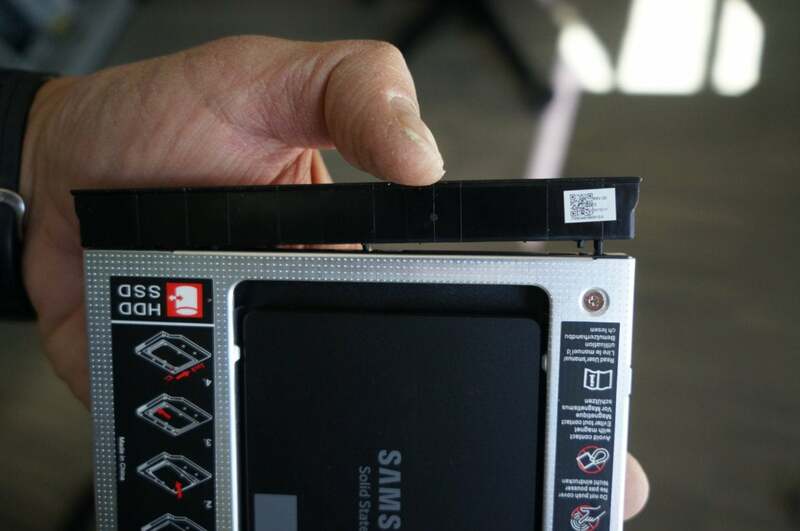 Now put your SSD into the tray, replace the screws, and slide it into the drive bay. 4. Restore your OS to the SSD and rock on. We didn’t test this configuration, but expect similar performance results as the M.2 SATA SSD drive. Remove the hard drive from the plastic drive caddy and place the SSD where it was. There’s one last upgrade trick we want to leave with you with: How to replace your optical drive with an SSD or hard drive. Besides needing an SSD, you’ll also need a caddy. We bought this caddy on Amazon for just $9, which is typical. It fits both 7mm- and 9.5mm-thick drives, but it’s a tight fit in most computers with 9.5mm so we recommend you stick with a 7mm drive. 1. To Install the drive into the caddy, simply put it in the tray and slide it onto the SATA connector. Then use the provided four screws and screwdriver to mount the drive. 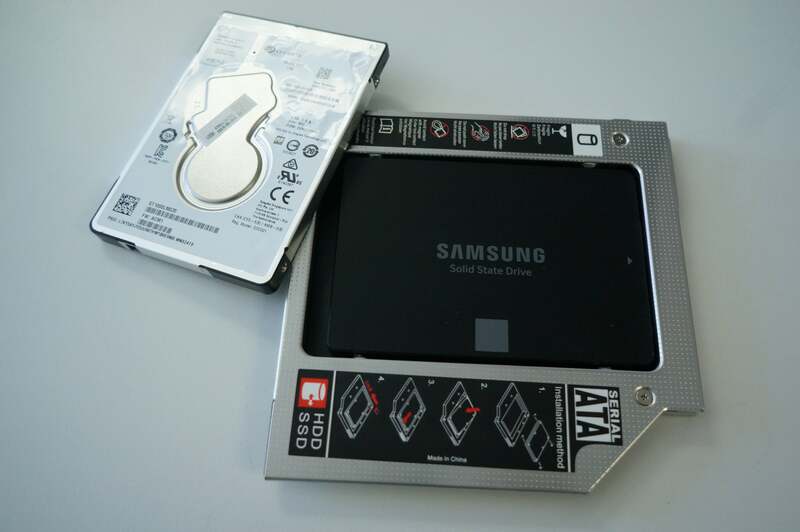 An inexpensive hard drive caddy lets you replace your optical drive with an SSD or hard drive. 2. To remove the optical drive from the laptop, turn the laptop over, and on the side where the optical drive is, look for a single screw near the center of the optical drive and about six inches from the edge. There may be a mark to indicate this is the captive screw for the ODD. Remove the screw. 3. Use your fingernail to pull the drive out by wedging it between the laptop body and optical drive. 4. With the drive out, you’ll need to transfer two things. The first thing is the metal bracket on the back end of the optical drive. This is what the screw that you removed earlier attaches to. Just remove two small Philips screws and then relocate the bracket to your new caddy. On top is the stock DVD drive. You’ll need to unscrew the two screws on the metal bracket and move it to the hard drive caddy (bottom). 5. The most difficult part in all of this may be removing the bezel from the optical drive to place on your SSD. It’s not mandatory, but foregoing the bezel will look ugly and will make it a little more work when you want to pull the SSD from the laptop. Almost every laptop optical drive follows an industry spec—with a different plastic bezel attached to it. 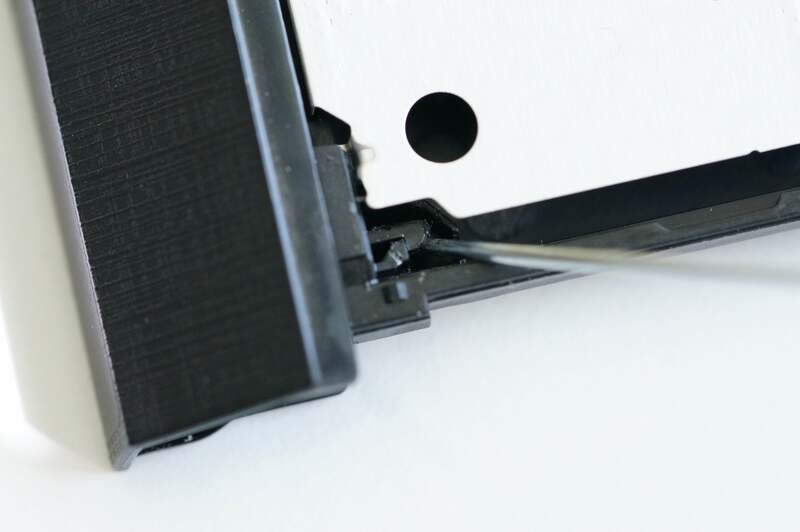 To remove the bezel, take a paper clip or screwdriver and carefully—carefully (they’re delicate)—bend the plastic retention arm on the inside and pop off one side of the bezel. There’s a second mount on the other side that doesn’t require any tools—all you have to do is gently angle the bezel so it comes off. To make it pretty, you’ll want to remove the plastic bezel from the original drive. 6. Now just transplant the bezel to your drive caddy by gently pressing it into place. On our drive caddy, this was nearly a permanent decision. Yes, we could remove the bezel, but it took a partial disassembly of the caddy to do so. On our drive caddy, it’s no fun to remove it so make sure you want your bezel on the caddy. That’s it. You can now take the caddy and slide it back into the bay on the laptop. This should give you all the auxiliary you want. This trick, by the way, is nearly universal from what we’ve seen on laptops with optical drive bays. Upgrades aren’t done in a vacuum. You prioritize them based on their returns. The greatest return with a budget laptop is to move from the stock hard drive to an SSD. 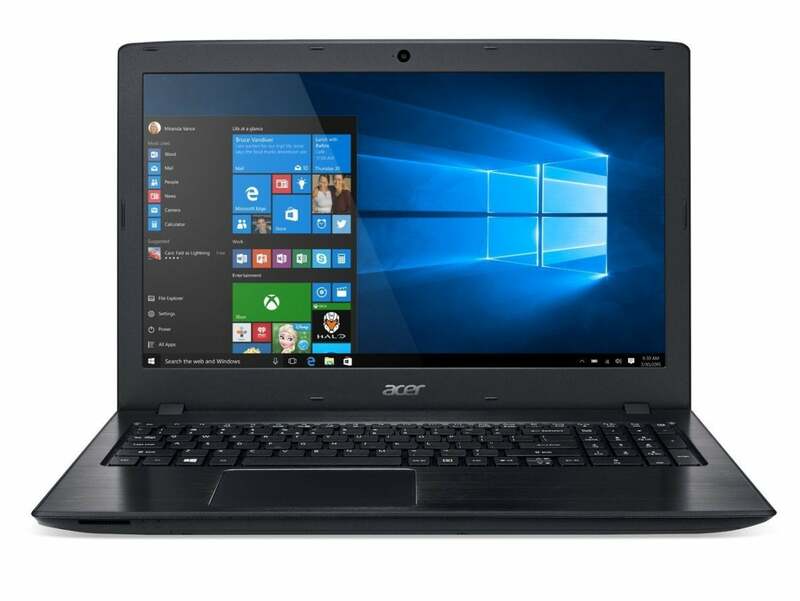 The performance benefit in bootup and overall responsiveness puts it at the very top of any upgrade list. There’s one more wildcard we should mention here and that’s Intel’s Optane Memory Technology—an SSD caching drive that enables your regular hard drive to perform as fast as an SSD. We’ve tested it and found that it does indeed offer tangible performance on the cheap. In fact, for $36 on Amazon, you could get truly “SSD-like performance” from your 1TB hard drive. 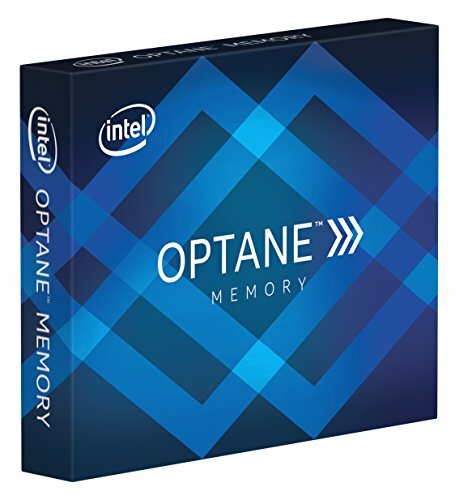 The problem: The Aspire E 15 in our test case doesn’t have the BIOS/UEFI support for Optane Memory. That’s really a shame because the laptop is the perfect candidate for Intel’s Optane Memory.